I have recently gotten into the beloved television series, The Office. The humor of this show is so awkward and hilarious, I find myself laughing out loud (alone) at least once during each episode. While watching an episode the other night, I realized how funny I was behaving about a silly little show. Let me explain. Though I have only recently been watching the show’s episodes consecutively, I always heard rumors about the characters and the plot from friends. 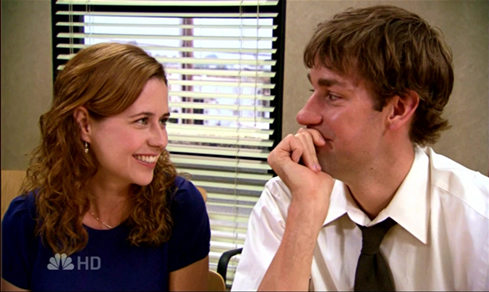 Specifically, I know Jim and Pam end up married and I believe (SPOILER ALERT) she just gave birth to their first child. I know all of this happens in future episodes (meaning ones I haven’t seen yet) but I still cringe at the idea that Jim is currently dating Karen (in season 3). It’s funny because even though I know the two people I want to be together DO in fact end up together, I still get upset when I see them dating or kissing others on the show. What’s funny is I think about my own life in comparison to this show. God knows who my “Jim” is already, but yet God still has to watch me make mistakes, and entertain the wrong guys, and even miss what’s right in front of my face from time to time. It has to be frustrating. Instead of cringing and giving up on me, though, God loves me and is patient with me (and my “jim”) as we work out all of our foolish issues. Because God knows we’ll eventually end up together. God knows what happens already (just like I know what happens in future episodes) even though we, the characters, have no clue! In literature, this is called dramatic irony. I bet if we looked back on our own lives we could see situations where God was probably shaking His head saying, “Don’t date her!” Or, ” Stop doing that!” Just like we shout at the screen when the woman walks into the house when we know the killer is hiding behind the door! With God, though, we have Grace and Mercy. He already knows how things work out, and He knows they are for His good. So, there is peace in knowing that however my story plays out, it’s going to be entertaining, adventurous, and for the greater benefit of My Creator. He wouldn’t steer me wrong, so I trust His artistic judgment and his talented way of piecing everything together. This is beautiful. Lord knows our Father was very patient with me in this area as well. Keep being the vessel God uses!